Daily Illuminator: Introducing Julie Yeager, MIB Coordinator! 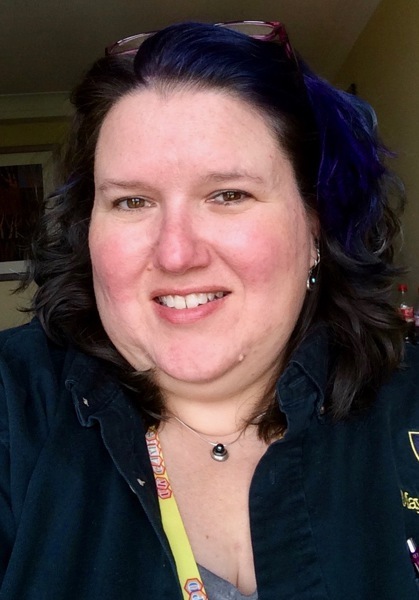 April 16, 2018: Introducing Julie Yeager, MIB Coordinator! Hello, SJ Games fans! As the newest member of the SJ Games team and the new MIB Program Coordinator, I've been asked to take a moment to introduce myself. My name is Julie Yeager, and I was most recently with Mayfair Games, where I spent the last five years managing the long-standing Game Shepherd Volunteer Program, and the past two years as the Director of Marketing & Community Engagement, overseeing their marketing and social-media efforts. I'm originally an Ohio native and now reside in Michigan with my very gamey husband (and MIB 0230! – Alex), where we both work from home (or one of the local coffee shops). I attended Siena Heights College and Bowling Green State University, where I studied Fine Art and Recreation Programming. I spent my first 20+ years of adulting working for the Girl Scouts, where I ran traditional and outdoor programs while working with many adult volunteers. Then, I joined the game industry in 2012 with Mayfair Games, eventually becoming a shareholder. This industry has afforded me so many opportunities and adventures that I would have never thought possible. In my spare time, I enjoy spending time with friends, playing traditional board and card games, photography, being outdoors, gardening, exploring and appreciating the arts, and traveling with my husband. I am excited to be part of the SJ Games team and overseeing one of the longest-running volunteer programs in the game industry!